The new installment of the enduring sci-fi franchise earns its title: Into Darkness. J.J. Abrams strikingly directs an intense picture in which epic scope is interweaved with the more personal fate of the Enterprise’s crew, most notably that of Kirk and Spock. Their strong and often tumultuous relationship has always been the beating heart of the Star Trek universe – Spock torn between his logical, rigid Vulcan side and his deeper desire to let his emotions flow; Kirk, meanwhile, in full-blown emotional turmoil. Abrams and returning screenwriters Alex Kurtzman & Roberto Orci, joined this time around by Damon Lindelof, earnestly up the ante. Compared to its excellent 2009 predecessor, Into Darkness is a more advanced story with more layers and richer introspection as well as grander spectacle and larger-than-life sequences. Their greatest and boldest achievement is structuring this “space opera” like a race-against-the-clock thriller. Although the film does not have a “countdown” (i.e. this is not Mission: Impossible), it takes the viewer on an outstanding roller-coaster ride that feels like traveling at warp speed aboard the Enterprise itself. To the dismay of the characters, this new Starfleet adventure is not (yet) about exploring strange new worlds, but rather about saving our own. Abrams orchestrates the film’s intensity to reinforce his characters’ plight. Unlike in other blockbusters, here the plot and action throw Kirk and his crew in extreme situations and confront them with a series of dilemmas that actually challenge their beliefs rather than just their well-being. 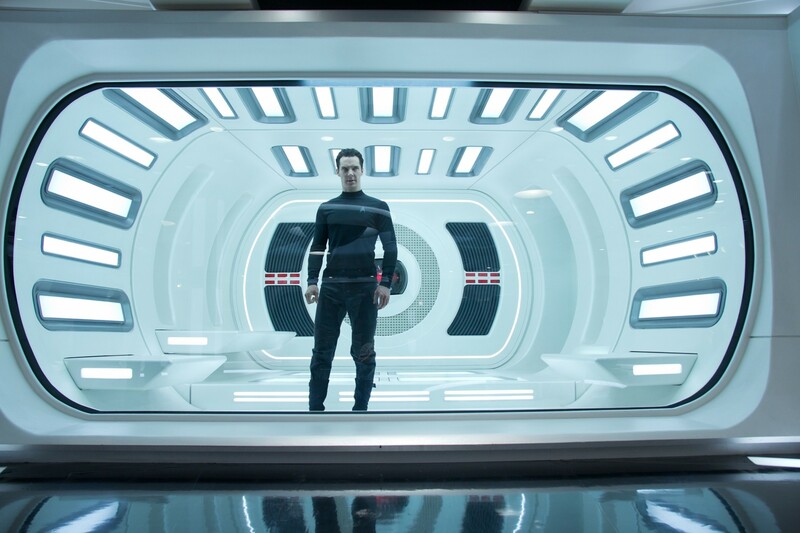 In the film, a mysterious and manipulative terrorist John Harrison is targeting Starfleet. The Enterprise is set to to annihilate him, and Kirk is out seeking revenge. But there’s more than meets the eye to Harrison, and for most of the film, you will – alongside Kirk – question his true purpose. The most recent James Bond film, Skyfall, was particularly intriguing in the way it de-constructed the slick image of the spy to present a more vulnerable, human hero. Into Darkness follows the same trend and depicts Kirk failing repeatedly: powerless, self-doubting, and scared… In an emotional scene, he states, “I don’t know what I am supposed to do, I only know what I can do.” He has to overcome the mediocrity of his egocentric behavior to touch greatness. But he will have to go through darkness to do so. Kirk is an aspirational hero, not because he is successful or badass, but rather because he spends most of the film beaten down – either physically or metaphorically. Spock has to undergo an opposite trajectory: he has to accept his pride and thus his emotions. While Kirk has to acknowledge he’s not the only one, Spock must learn to genuinely, not superficially, value his own individuality. Thematically the film can be summed up by a quote from Star Trek’s original creator, Gene Roddenberry: “It is the struggle itself that is most important. We must strive to be more than we are. It does not matter that we will not reach our ultimate goal. The effort itself yields its own reward.” Into Darkness ultimately celebrates ideals of optimism and self-sacrifice and is a passionate evocation that beyond darkness – through perseverance – lies greatness. Abrams is interested in the way his characters metaphorically hang on to light when no one else would. This is not a Dark Knight-like reimagination of Star Trek. It is romantic and exciting, not brooding. The tone is exhilaratingly driven by the emotional content. Quiet, subtle beats are given more significance by their proximity to thundering action sequences and superb self-deprecating, cold humor that highlights the characters’ anxieties and hopes. The cast is absolutely flawless; Chris Pine perfectly embodies this vulnerable and tormented Kirk; Zachary Quinto, as Spock, excels at suggesting for most of the film, and then exploding. The new additions to the cast are Benedict Cumberbatch – a magnetic and wildly entertaining villain – and Alice Eve, as the beautiful and resourceful Dr. Carol Marcus. Stylistically, the film showcases Abrams’ specific Trek look: crisp images, lush colors, fluid camera movements, tight close-ups with no headroom, a profusion of inserts, and punchy but seamless editing. It’s worth noting that the number of now-infamous lens flares has greatly decreased. They are present mainly in establishing shots or during certain action sequences, but only when the set justifies their use (strobing lights, spaceship attacks etc…). Now there’s the eternal question about Star Trek. How will it play to a general audience, one with absolutely no knowledge of the characters? Well, for them, the film will be an entertaining, skilled blockbuster with killer pace and enjoyable sci-fi fantasy with unarguably strong characters. But for fans of science fiction, and more specifically Star Trek fans – whether of the 2009 reboot or the Original Series – it will play like an ode to the deep essence of Roddenberry’s creation by ‘captain Abrams’ of the ‘USS Bad Robot’. The bottom line is – like all J.J. Abrams pictures to now – Star Trek Into Darkness is an incredibly fulfilling experience when you’re a movie fan. Written by: Theo Zenou on May 21, 2013.